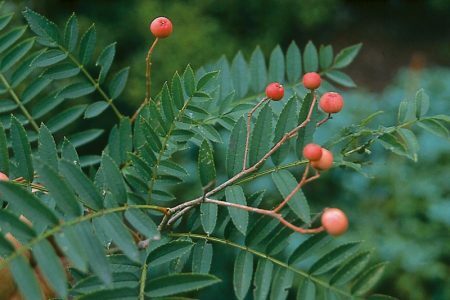 Sorbus vilmorinii is a small, spreading Pink-Berried Rowan with branches that arch elegantly outwards to cast a very light shade. Clusters of white spring flowers produce rosy pink berries later in the summer, slowly fading to almost white as winter approaches. The pretty leaflets of mid-green turn to red and purple hues in autumn, contrasting nicely with the changing colours of the berries. Vilmorin’s rowan is an ideal small specimen tree in the lawn as it will not shade the grass too heavily. This tree likes sun or partial shade and grows best on moderately fertile, moist but well-drained soil.